Weston Town Hall, Weston-Super-Mare (client North Somerset Council), a collaboration with Alec French Architects and Willmott Dixon is now a completed refurbishment project with a contract value of £9.7m. Going over and above standard guidelines, MACH Acoustics focused on analysing the spread of sound pressure level and the speech intelligibility over distance, rather than purely focusing on reverberation time in the sense of traditional design. 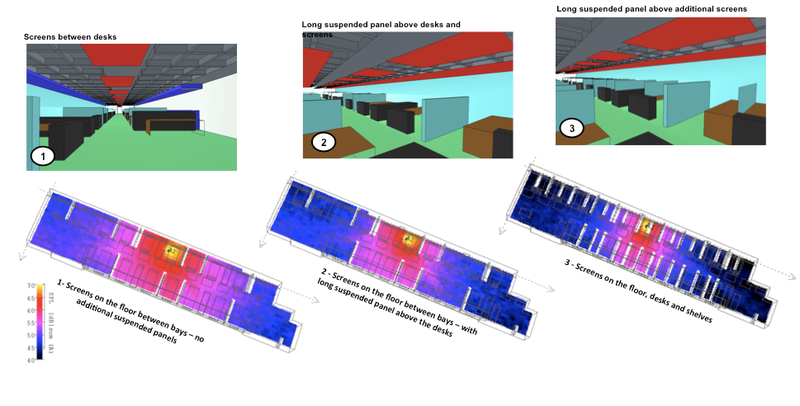 MACH used extensive computer modelling and produced video/audio simulations (‘auralisations’) to demonstrate the acoustic benefits in respect of the aesthetic views of the architect, the budget of the project, the low carbondesign initiative and the satisfaction of the client. 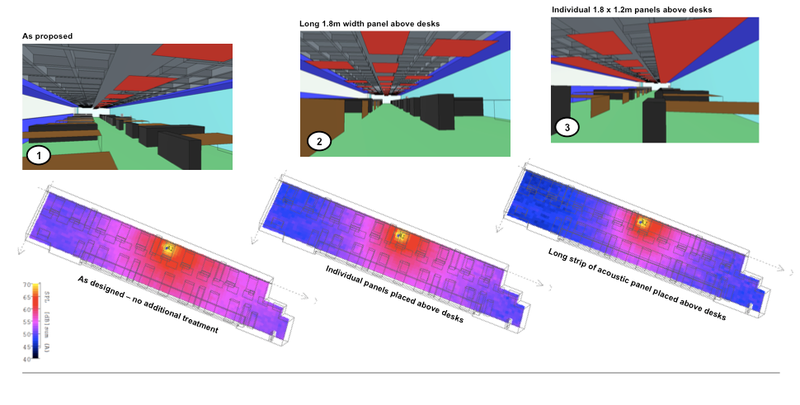 This allowed us to evaluate the level of acoustic separation between desks and groups in large open plan areas, with and without noise mitigation methods including desktop screens and acoustic soft treatment. Our approach focused on the reduction of sound pressure level (SPL) over distance, and the level of speech intelligibility (STI) between individual and grouped desk areas, presenting results through auralisations and videos to provide a cost effective sustainable solution. A multitude of CATT Acoustics models were created to assess several factors. Firstly effective was the addition of acoustic treatment in the form of suspended rafts above the walkway between desks and later above desks, Whilst the absorption coefficient of these are similar to BCO traditional guidance, the quantities of panels are vastly reduced by specifically placing them in the most effective areas over desks and cabinets/shelves to reduce noise transfer (Figure 1). The next step was to introduce screens to enhance the acoustic separation between desks (Figure 2). The most effect. Whilst combining the full extent of suspended rafts and screens provide the best option acoustically, it was considered by the design team that a combination of the screens and the initially proposed amount of suspended treatment was the most cost effective solution. Still, this achieved a reduced transmission of sound in line with what traditional BCO guidance would have provided, with the benefit of reduced costs and a lower carbon footprint. As an acoustic consultancy we understand that it is our client and end users that benefit or suffer from the result of our work. We therefore prioritize the importance of good communication. The illustrations within this document have been taken straight from our acoustic report and were complimented by a set of auralisation videos that were distributed to the design team and client. Links to these three videos are provided below.